CAVS stepped up efforts to improve its research strength through enhanced digital information acquisition and use. 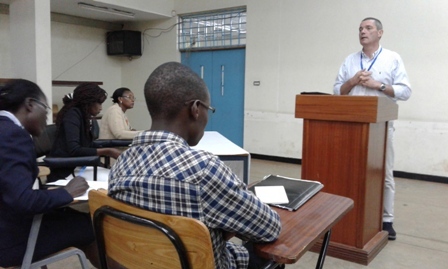 Thus, a training by Teal group from Cornell University, University of Nairobi and South Africa was organized in September 2016 at CAVS library, attended by staff and post graduate students. In preparation for the attachment period that was scheduled for September to November this year, fourth years BSC Food Science and students shared with their junior colleagues attachment experience as well as giving valuable pieces of advice during the industrial training. There is no doubt that this mentorship model bore fruit given the level of interaction that took place. During the 2nd University of Nairobi Innovation week, Department of Food Science, Nutrition and Technology through its value addition activities in dairy and root crops took part this August during the occasion that saw many participants engage members of the University. SPIRIT and Feed the Future Projects also featured in this occasion prominently.